New polls Likud gaining ground, while Labor loses nearly half its seats. Prime Minister Binyamin Netanyahu would easily be reelected to a fifth term as premier – his fourth consecutive term – if new elections were held today, a poll released Monday shows. According to the results of the latest Geocartographia poll, which surveyed 600 Israeli adults last Thursday, Netanyahu’s Likud party would remain the largest party in the Knesset, gaining one seat and rising from 30 mandates to 31, if new elections were held today. In addition, Netanyahu’s coalition would retain its current strength of 66 seats, compared the opposition’s 54 seats. That represents just a one-seat decline from the 2015 elections, when the six coalition factions won 67 seats. One MK from Yisrael Beytenu, Orly Levy, broke away from the party in 2016, and is currently an independent MK in the opposition. 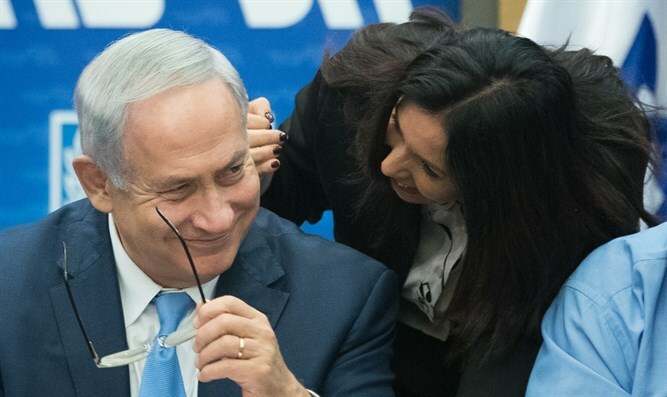 The Zionist Union, a joint list including the Labor and Hatnuah factions, would lose nearly half of its strength if new elections were held today, falling from the 24 mandates it won in 2015 to just 13. The primary beneficiary of the Zionist Union’s decline appears to be former Finance Minister Yair Lapid’s Yesh Atid, which surges from 11 seats to 26. Education Minister Naftali Bennett’s Jewish Home party gained 4 seats in the poll, rising from 8 mandates to 12, while Defense Minister Avigdor Liberman’s Yisrael Beytenu fell from the 6 it won in 2015 to just 4, one less than it currently possesses following MK Levy’s departure. The United Torah Judaism party would gain one seat, winning seven, while Shas would lose three, falling to just four mandates – barely passing the 3.25% electoral threshold. Finance Minister Moshe Kahlon’s Kulanu faction lost two seats in the poll compared to its 2015 showing, falling to eight mandates. The far-left Meretz party gained a single seat, rising to six mandates, while the predominantly Arab Joint List party fell by four mandates to nine seats.